Bedrooms are our sanctuary and place of rest. 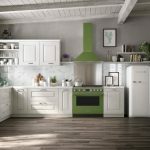 They are also interiors that require exceptional functional storage and practicality to cope with the demands of everyday life. 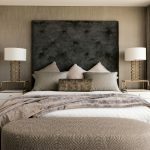 So how do we create wow factor in a bedroom, and establish one that is stylish, easy to maintain, practical and beautiful to live in and live with? I have taught interior design and interior decoration for 17 years and have seen many students tackle the problem of space planning and material and product specification when creating the ultimate bedroom. With our global access to products and the speed of online searching, sourcing items has never been easier. Five of Australia’s top interior and textile designers have shared their secrets on the tools that are needed to craft a professional bedroom. 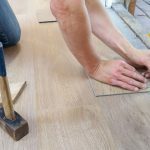 There are rules to interior design that, if followed, enable you to create a personal and meaningful interior that simply works. Following a design process in your bedroom will help create a professional look for your interior. According to our experts, the key to successful bedroom design is to create a concept, plan before you purchase and embrace the elements and principles of interior design. The elements of design are the building blocks used to create beautiful interiors. These elements are what make up an interior and they need to be sourced and crafted with care and precision: line, shape, size, space, colour, texture and light. How you manipulate elements is what designers refer to as the principles of interior design and is akin to the method of cooking in a recipe. It is what we do to the elements — great design will successfully mix them with balance, contrast, emphasis, proportion, pattern and proximity. How we apply the principles of design determines how successful we are in creating a stunning space. 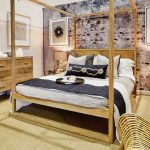 Australian designers Greg Natale, James Dawson and Kate St James chosen their favourite bedroom project and products to share the how-to of beautiful bedroom design. Where do you start with bedroom design? 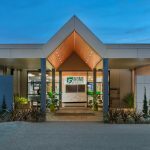 As with all good interior design, you need a concept and that concept can be derived from anything that has personal meaning to the designer or client. 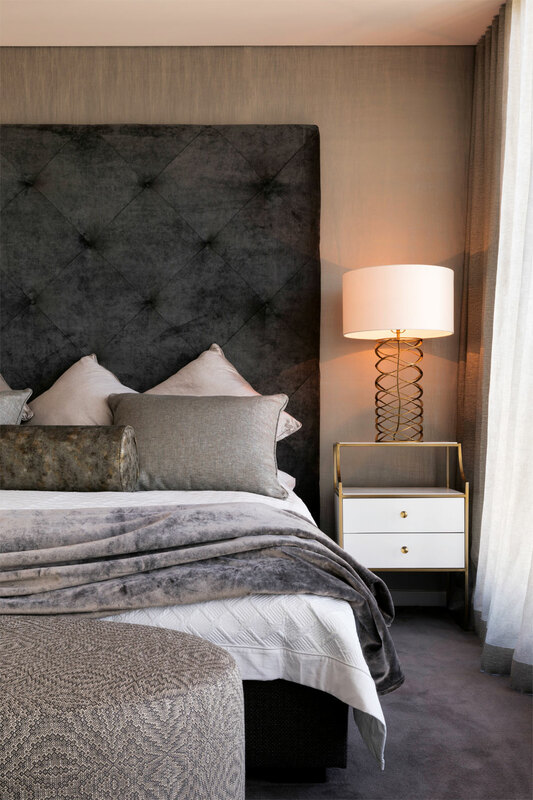 Award-winning Australian designer Greg Natale reveals that his secret to styling a stunning bedroom is primarily about the formal finish of the space. This is achieved through the use of layering products and materials. 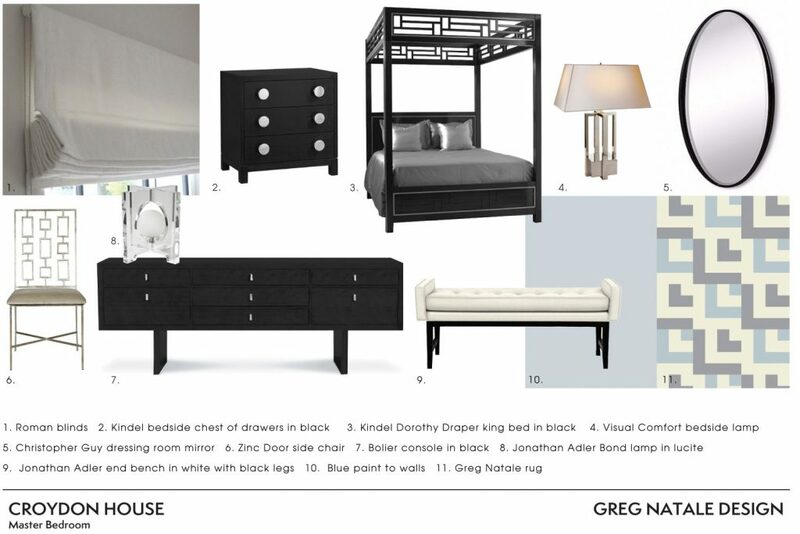 Greg’s favourite residential bedroom design in his collection is currently the Croydon House’s master bedroom. 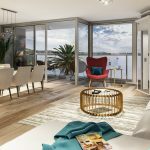 The interior was designed for clients in their mid-40s living in Sydney’s Inner West. The majestic home, Edwardian in style, provided Greg with architectural and stylistic cues to work with. The tall ceilings and bay windows, typical of the Edwardian era in Australia, provided a perfect backdrop for the clients’ request for a four-poster bed. This is where the elements and principles of interior design come into play. 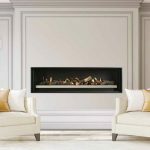 There are seven elements and seven principles of interior design, and when these are crafted with creativity and innovation, you have a formula for stylistic success. Collect images of furniture and products that work with your concept and put them together on a design board or one of the many digital design apps that are available online such as Photo Collage, Polyvore or Olioboard. If the composition doesn’t look good as an image, it’s not likely to work in an interior. Contrast is one of the key design principles embraced in the Croydon House. It has been bravely applied to tone, colour and scale and has resulted in a beautiful interplay of opposites. Colour evokes mood more than any other design element. The romantic powder blue walls, evocative of the Edwardian era of the house, contrast with the black Japanese flooring and oriental-inspired, geometric four-poster bed. The concept is further reiterated with the juxtaposition of the black leather upholstery on the white timber window seat. Harmony is created throughout the interior as this interplay of contrast continues. 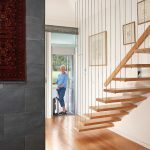 The soft, tactile texture and colours of the custom-designed Greg Natale floor rug adds depth and interest and contrasts with the glossy black timber floor. The heroic scale and proportion of the furniture was essential in creating intimacy in a dramatically large bedroom with very tall ceilings. The height of the home was visually reduced to a more human scale with the use of the Dorothy Draper custom-made bed. “It is about proportion, and size drives the product choice,” says Greg. 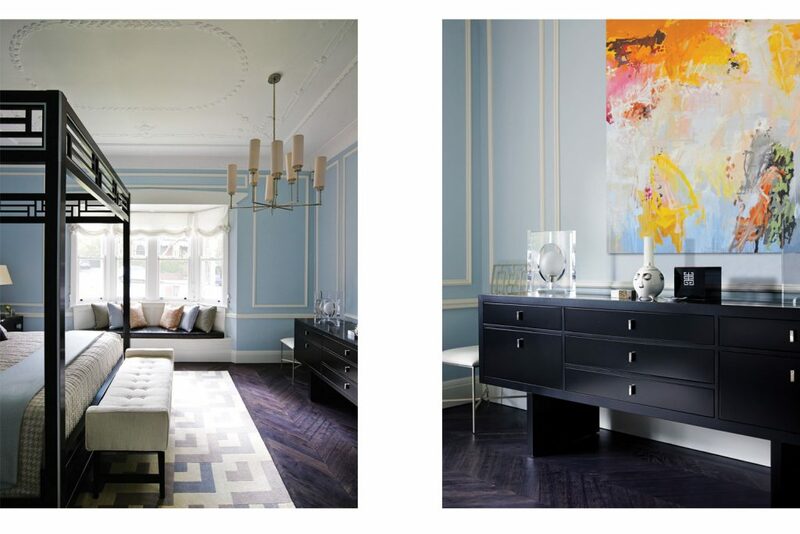 “If everything is drawn to scale as a furniture plan, we get the perfect-sized credenza, rug and mirror. The use of scale gives these elements a heroic character — whether you are working in a small or large space, you are still working with the same elements. A foot stool is like a tie that makes or breaks your dinner suit — if I was wearing a suit with a wide lapel, I would wear a wide tie. The same proportional rules apply to your bedroom design. Patterns tell a story, be it cultural, symbolic or structural. Patterns are Greg’s signature design principle and he uses them with control and restraint. The Croydon House is a beautiful example of the use of rectangular repetition. 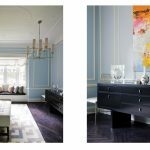 The rectangle is the focal shape of the interior, from the moulding on the walls and the form of the furniture to the intricate detail in the bedframe, the mid-century metalwork in the occasional chair and the shape of the handles on the credenza. The use of vertical lines in the bedroom creates movement and guides your eye throughout the interior. The horizontal lines of the timber moulding here add a secure feeling to the space. However, Greg has then added decoration to this strict use of line. Inspired by Hollywood regency, this bedroom is soft, classic, transcends trends and time and is both masculine and feminine all at once. Shop around for pieces of furniture you adore. A bedroom is your most private room in the home; it should be curated with layers of furniture and products that reveal who you are. There are many suppliers in Australia that specialise in bedroom furniture and products. Don’t buy a package bedroom suite — aim to source your bed, bedside tables and tall boy from different suppliers. Find a custom-made ottoman and rug and link them together with the application of design principles. 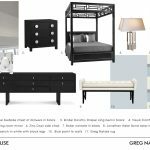 Some of Greg’s recommended suppliers include Baker Furniture, Minotti, Jonathan Adler, James Said and West Elm. Take pieces of beautiful furniture and layer them in the interior. 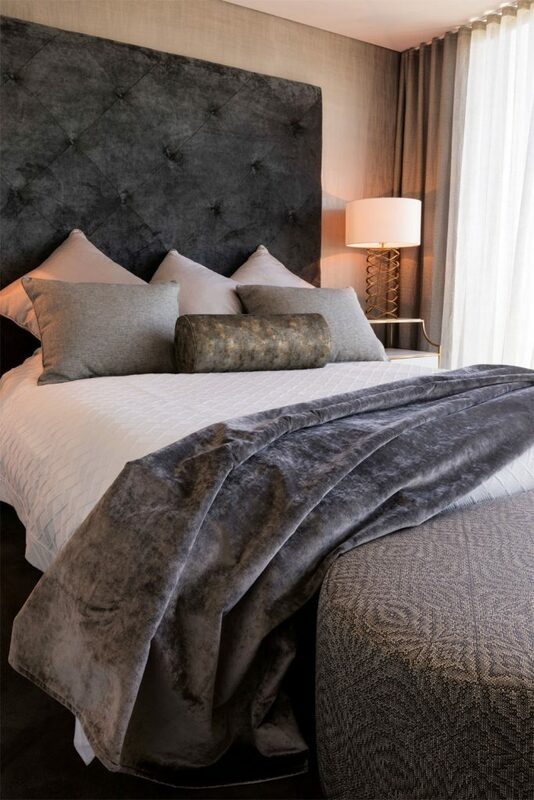 Layers of artwork, beds, lamps, linen, rugs, lighting, cushions, furniture, mirrors and artefacts that are unified through a strict application of the elements and principles of design will create a formal and professionally styled bedroom, no matter the style. “Understand the concept of layering. Start with the big pieces — bed and beside tables, a large floor rug, decorative or tactile cushions, linen, quality art, a beautiful pendant light — and embrace the concept of layering right down to the small accessories and coffee table books,” says Greg. “The concept of layering is the most basic point of decorating. 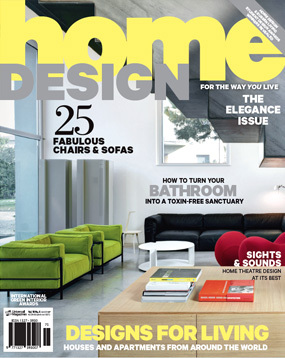 Look for dramatic, geometric or organic lines in feature furniture for your bedroom design, then repeat, repeat, repeat! Danielle encourages her clients to display the treasured items they have collected, which tell a story of who they are. Vignettes are a great way to style your memories in your bedroom. Collect an odd number — usually three and no more than seven — of treasured items, in three different colours and textures and arrange them on a sideboard in a triangular shape. You can use this area as a memory jerker in your bedroom and change it around regularly! Danielle’s New York Glamour master bedroom in the Melburnian Apartments oozes drama and luxury appeal and is the perfect combination of masculine and feminine. The scale in Danielle’s New York Glamour master bedroom is exaggerated and manipulated to provide an illusion of grandeur. As is often the case in apartments, the size of the room was a challenge. 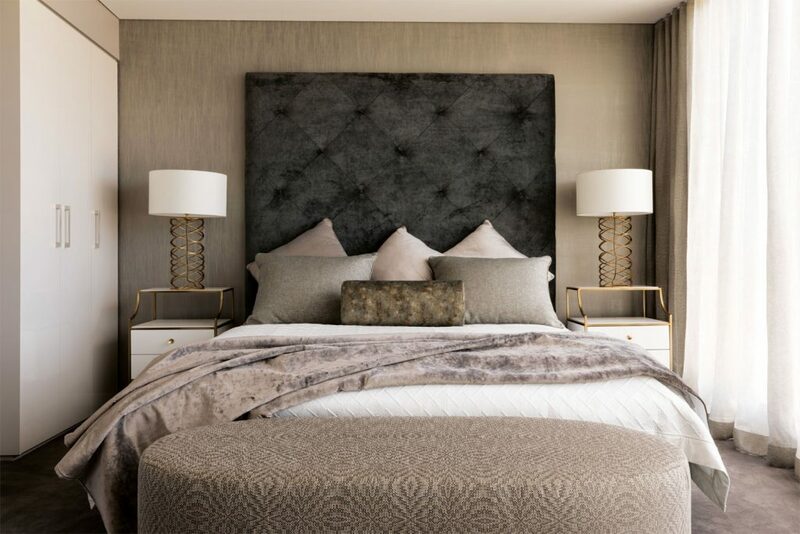 Danielle’s clients prefer a king-size bed and space was an issue, so she decided to add some impact to the space by customising a diamond-patterned oversized bedhead, which takes the eye up the wall and balances out the width of the bed in this limited space. A small bedroom does not necessarily demand small furniture. Danielle’s New York Glamour master bedroom is all about emphasis and dominance. The oversized luxury headboard adds charm and grace to the bedroom. Lighting is key to this interior and adds great value to the future marketing of the property. The layering of materials and textures, from the soft gold luminous wallpaper to the end of the ottoman, creates harmony and a sense of sophistication. Danielle then sourced the two-tiered bedside tables, placing the bedside lights on the upper tier, which create drama and balance out the bedhead. 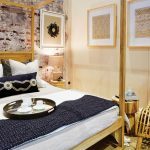 The designer also has some go-to bedroom suppliers for apartment living and uses a bedroom design checklist for every interior project she works on. 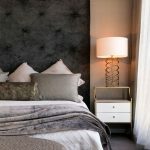 Interior designer, author, editor, fellow of the Design Institute of Australia and company director of St James Whitting, Kate St James shares her philosophy on bedroom design. 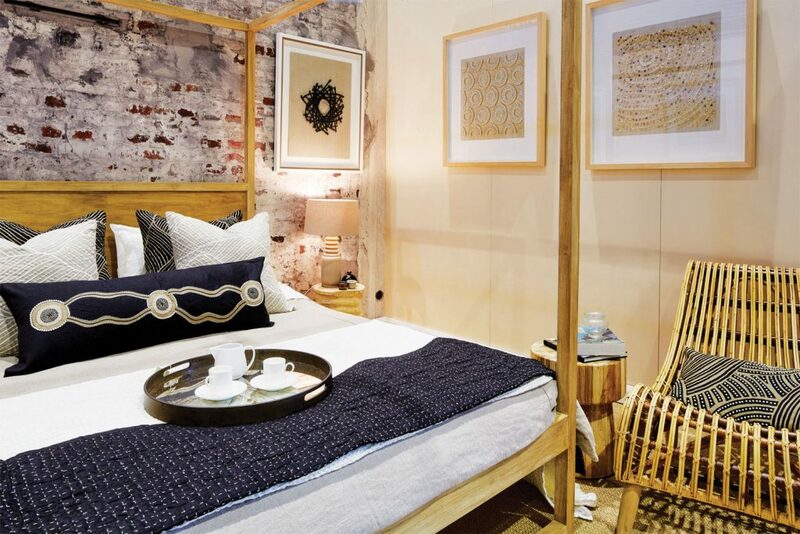 When creating beautiful bedrooms that not only look good but are future-proofed and enhance the health and wellbeing of the people that reside in them, Kate looks for sustainable and beautiful products and materials for her projects. 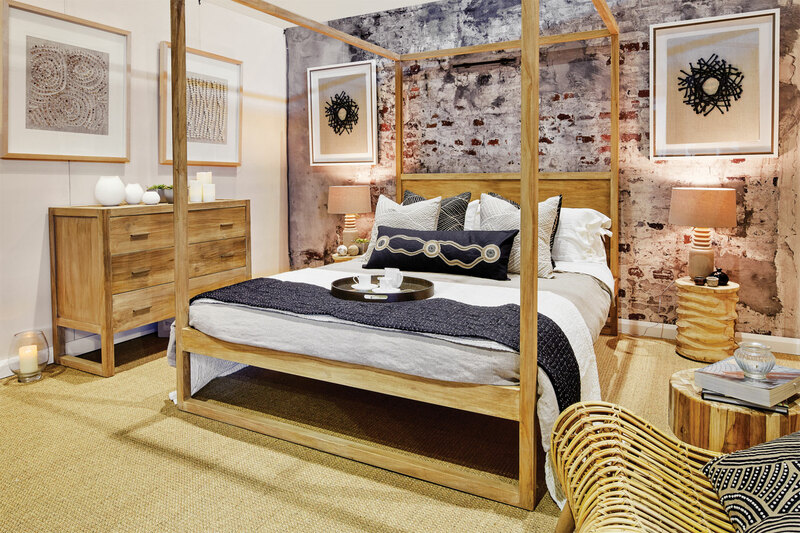 Kate’s Eco Urban Retreat, an exhibition interior, designed for the 2016 HIA Home Show’s Sustainable Rooms by Design, demonstrates how easy it is to design a contemporary and healthy bedroom — and it took out the People’s Choice Award. Kate specifies and uses only the most environmentally sustainable, eco-friendly products and practices in her work. When designing your bedroom, choose furniture that has been made from natural, organic, renewable sources with no volatile organic compounds (VOCs). Look for products and companies that contribute to your health and the health of our environment. 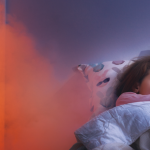 You will spend eight hours a night breathing in the air from your bedroom, so you want to ensure it is not full of off-gassing pollutants from toxic materials and finishes. A specific colour palette is one of the key elements that is embraced in the Eco Urban Retreat. A controlled colour palette is successful when products and materials have a connecting relationship — this is referred to as proximity. Proximity doesn’t mean that elements must be placed together; it means they should be visually connected in some way. Every product in the Eco Urban Retreat relates to one another. 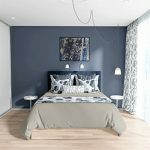 This is a great technique to use in your own bedroom design. Choose a palette you love and then control your colour palette. Each product needs to fit within the selected scheme. 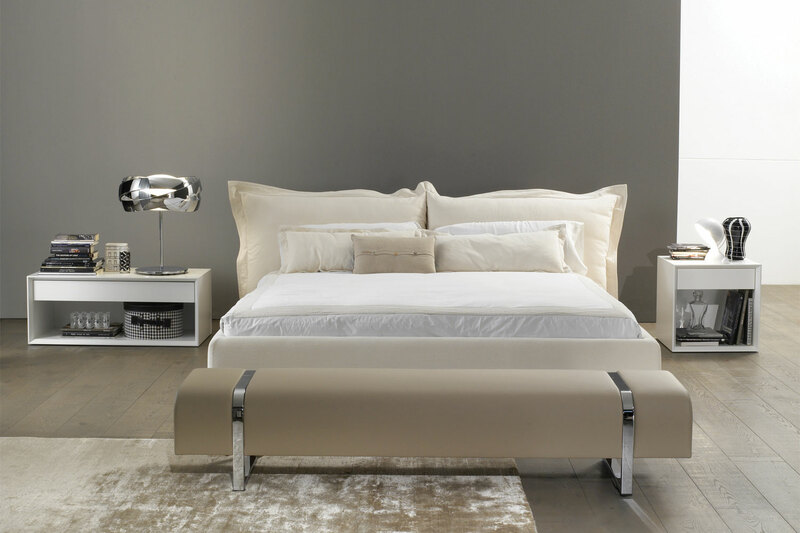 It is the palette and relationship of each item to the next that creates harmony in a bedroom. Here, Vision Wallcoverings’ aged-brick wallpaper adds strength to the light plasterboard exhibition wall and creates a solid background to frame the timber furniture. All the colours of the furniture, materials and products have been extracted from the wallpaper pattern and then nestled together to create a soft and inviting eco sanctuary. Bedrooms need to have plenty of circulation space and be free of obstructions. Ensure there is 1 metre of clear space around at least one side of the bed to enable inclusive access at all times. There are many ways to plan your bedroom space, from a scale hand drawing to free online three-dimensional programs such as SketchUp. Kate creates moodboards and 3D models of her bedrooms before specifying the furniture for her clients. The Eco Urban Retreat celebrates a symmetrical use of space. Six large Designer Boys artworks are aligned at the same height and hung directly opposite each other, creating formal order and stability. This is then contrasted with the organic forms of the Uniqwa Furniture Congo occasional chair that beckons a good book at the end of a long day. Find that one product, such as the wallpaper in the Eco Urban Retreat, and extract your controlled colour palette throughout your bedroom. Then add light. Artworks look exceptional uplit in bedrooms and have an art gallery quality about them when illuminated with mood lighting — always install dimmers in your bedrooms. 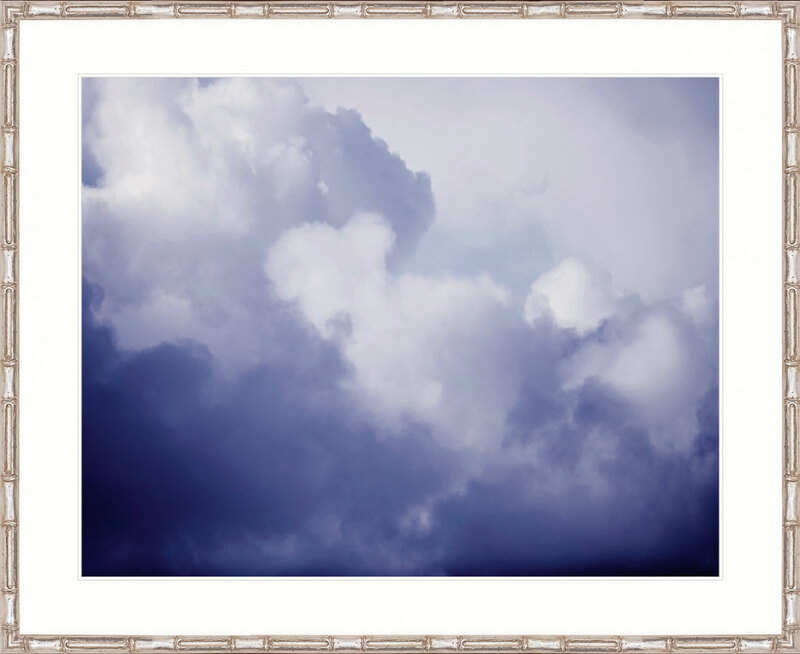 And don’t forget to frame your artworks the same size and in the same or complementary material. Be brave and use large prints or photos and lots of them. 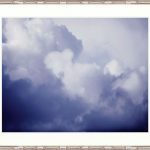 Small, single artworks can look lonely and awkward in a bedroom. As consumers, we also have a responsibility for the items we purchase; it’s not hard to take the time to source suppliers that produce products that are beautiful and healthy to live with.